, Google TV makes your site easily viewable to people lounging on their couch. Google TV is a platform that combines your current TV programming with the web and, before long, more apps. It’s the web you love, with the TV you love, all available on the sofa made for you. Woohoo! Because Google TV has a fully functioning web browser built in, users can easily visit your site from their TV. Current sites should already work, but you may want to provide your users with an enhanced TV experience -- what's called the “10-foot UI” (user interface). They'll be several feet away from the screen, not several inches away, and rather than a mouse on their desktop, they'll have a remote with a keyboard and a pointing device. See our Spotlight Gallery for more examples of TV-optimized sites. What does "optimized for TV" mean? Text is large enough to be viewable from the sofa-to-TV distance. How can webmasters gain a general idea of their site’s appearance on TV? And don’t forget, if you want to see your site with the real thing, Google TV enabled devices are now available in stores. Our team just published a developer site, with TV optimization techniques, at code.google.com/tv/web/. Just as mobile phones make your site accessible to people on the go, Google TV makes your site easily viewable to people lounging on their couch. Google TV is a platform that combines your current TV programming with the web and, before long, more apps. It’s the web you love, with the TV you love, all available on the sofa made for you. Woohoo! 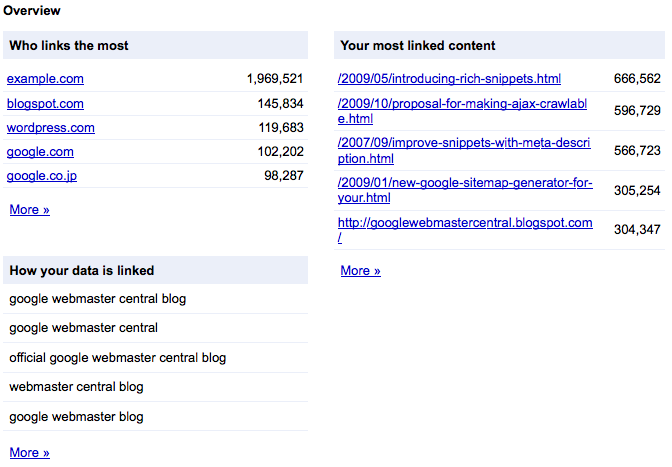 is now updated to show you which domains link the most to your site, in addition to other improvements. On the overview page you'll notice that there are three main sections: the domains linking most to your site, the pages on your site with the most links, and a sampling of the anchor text external sites are using when they link to your site. Clicking the “More »” link under the “Who links the most” section will take you to a new view that shows a listing of all the domains that link to your site. Each domain in the list can be expanded to display a sample of pages from your site which are linked to by that domain. The "More »" link under each specific domain lists all the pages linked to by that domain. At the top of the page there's a total count of links from that domain and a total count of your site's pages linked to from that domain. If you drill into the “Your most linked content” view from the overview page, you’ll see a listing of all your site’s most important linked pages. 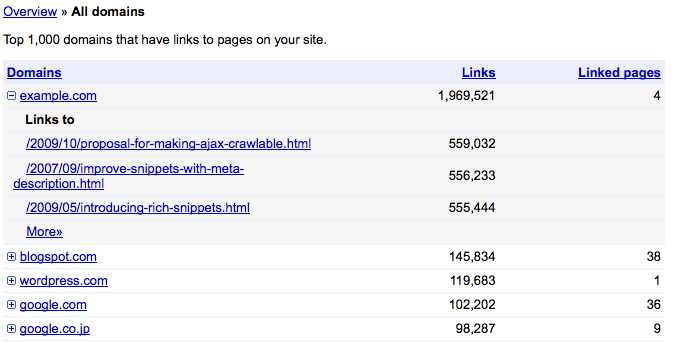 There's also a link count for each page as well as a count of domains linking to that page. Clicking any of the pages listed will expand the view to show you examples of the leading domains linking to that page and the number of links to the given page from each domain listed. The data used for link counts and throughout the "Links to your site" feature is more comprehensive now, including links redirected using 301 or 302 HTTP redirects. Each page listed in the "All linked pages" view has an associated "More »" link which displays all the domains linking to that specific page on your site. Each domain listed leads to a report of all the pages from that domain linking to your specific page. We hope the updated “Links to your site” feature in Webmaster Tools will help you better understand where the links to your site are coming from and improve your ability to track changes to your site’s link profile. Please post any comments you have about this updated feature or post your questions in the Webmaster Help Forum. We appreciate your feedback since it helps us to continue to improve the functionality of Webmaster Tools. 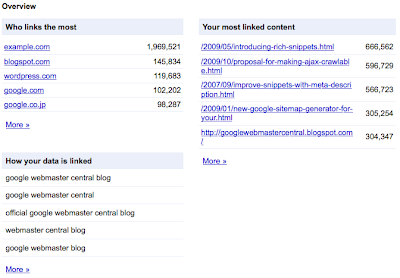 The "Links to your site" feature in Webmaster Tools is now updated to show you which domains link the most to your site, in addition to other improvements. On the overview page you'll notice that there are three main sections: the domains linking most to your site, the pages on your site with the most links, and a sampling of the anchor text external sites are using when they link to your site. Assuming that these three URLs display exactly the same product page for tasty Swedish fish candy, Google only needs to crawl and index one of them. You can simply select action “Ignore” for parameter “sid” in Webmaster Tools and Google will just crawl and index one of these URLs, avoiding duplicates. These four URLs show products in the candy category. There are enough items in this category to fill two pages, and the products shown can be sorted by price, in ascending or descending order. Selecting action “Ignore” for parameter “sort-by” would be incorrect and could potentially limit our indexing of the site. This is because, after ignoring “sort-by”, we would consider the first two URLs equivalent and may choose to index the URL with ascending sort order. We would also consider the last two URLs equivalent and may choose to index the URL with descending sort order. In this scenario, we would be indexing the candy category inconsistently, with some candy products appearing in both of the pages selected for the index, while other candy products not appearing in either of them. 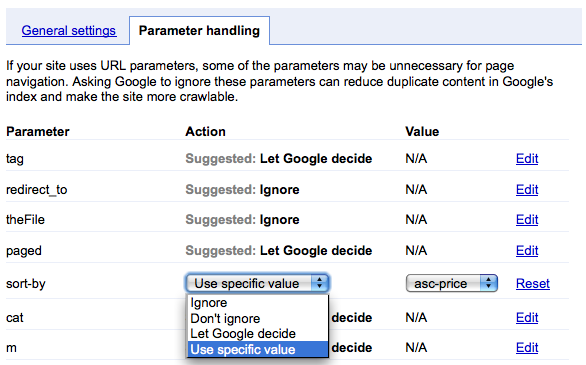 The right solution comes from the new action “Use specific value” now available in Webmaster Tools. To avoid duplicates but still keep our indexing consistent, you can simply select action “Use specific value” for parameter “sort-by” and choose one of the valid values, say “asc-price”. After this, our indexing would be fully consistent, as we would focus only on the pages with products sorted by ascending price. Messages: Some sites receive lots of messages in the Webmaster Tools Message Center. With this update we've added the ability to "star" specific messages that you deem important. There's now a separate "Starred" view where you can see all the messages that you’ve starred, making tracking and finding the most important messages for your site a breeze. We hope these updates make Webmaster Tools even more useful for your site. Please post a comment if you have feedback on any of these updates; or if you have questions, post them in our Webmaster Help Forum. We've just released updates to several features in Webmaster Tools to provide you with more detail and more control of how your site appears in search results. 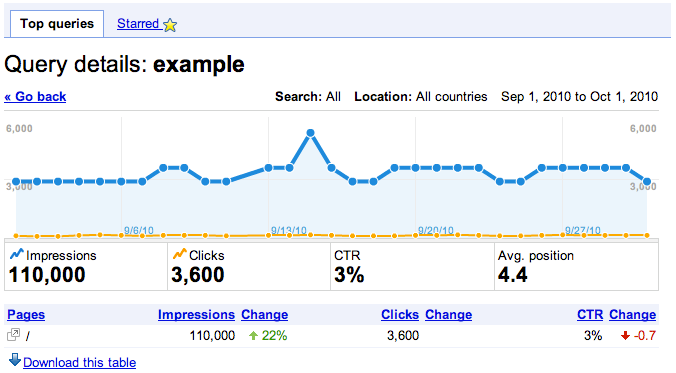 Search queries: Time does not stand still and neither should your site. 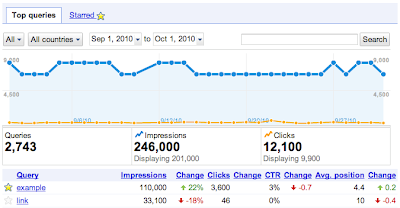 With that in mind we've added a "Change" column next to the impressions, clicks, clickthrough rate (CTR) and position columns, making it easier to identify trends for each of these important metrics. The change column is tied to the date range you specify, which should help when you're trying to pinpoint when a particular change occurred. 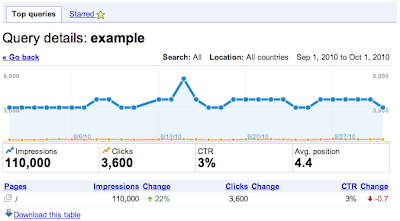 Each query listed in Search queries now links to a query details page which includes a graph of impressions and clicks for that specific query, providing a quick visual of its performance in the search results over time. 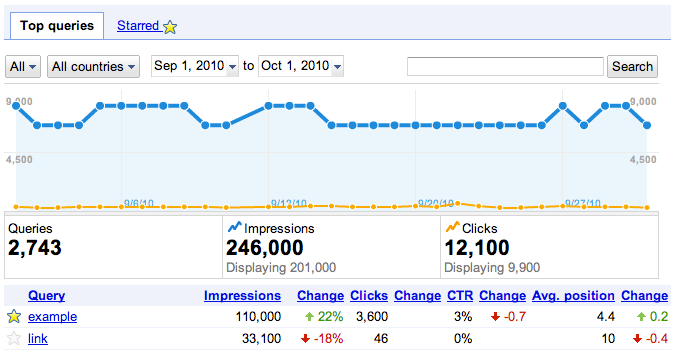 Below the graph is a table listing of the pages returned in search results for that query, along with impressions, clicks and CTR. Each column in the table is sortable, offering a quick way to re-sort the data based on what's most interesting to you. If you'd rather use your own favorite tool to slice and dice the data you can use the "Download this table" link to export all the information from the main Search queries page or from each individual query details page.